All through the show, Hoey would joke and tell stories to the audience. He has a great stage presence and develops a real connection with the people who come to listen to him. I met one man in the audience who had traveled all the way from Michigan, with no real plans on where he was going to stay: he just came for the show. After the acoustic set there was a brief intermission. When they came back, Hoey had traded the suit for some jeans and a t-shirt, joking around that he had burned that suit up. The band continued to jam, now they really rocked with an electric set. They slid from song to song with ease. If you watched really closely, you could see the guys quietly interacting with each other, sending each other signals with a quick nod or smile. Part way through, Hoey introduced a special guest to the audience and his 12 year-old son walked on. He told us the song they were going to play was, “The Dog Ate My Homework.” It was a precious moment watching the father and son play together on matching fender guitars painted with the American flag. He encouraged his son as they played together on stage, both lifting their guitars high as they finished their set with a flare. There was a round of applause as Ian left the stage. 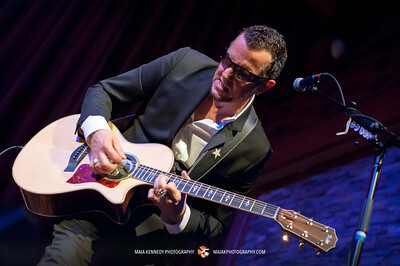 The show continued with six more songs, including one of my faves, “Boss You Around” off of his new album, Deja Blues. The three musicians showed off their stuff with solos; it was easy to get lost in the tunes they were serving up. As Hoey was rounding up the show, he made sure to thank the troops; it was a nice gesture, reminding us that it was Memorial Day Weekend. When he seemed about to leave, the audience jumped to their feet for a standing ovation and yelled for more. This seemed to convince Hoey to stay. He turned to his band and after a few words, they ended the show with a couple more songs, including a beautiful rendition of the Star-Spangled Banner. The evening had started with solo performer, Gina Marsh, a young talent discovered by Gary Hoey. He also produced, engineered, mixed and mastered her latest CD, Isn’t it Crazy. She cheerfully walked on stage carrying her guitar and introduced herself. The audience gasped hearing she was only 16 years old. They were entranced by her calm stage presence and her strong voice that sounded so experienced, well beyond her years. She sang mostly original songs and one cover song by Maroon 5. Her set was short but sweet and the audience loved her. In fact, “sweet” describes her perfectly; she walked off stage grinning from ear to ear with the audience’s applause following her on the way out. At the end of the night, Hoey announced that all the musicians would be going to the lobby to meet with everyone. There was no uncomfortable wait with people hanging around and restlessly waiting for the band to make an appearance; the guys appeared to go straight from the stage to the lobby. They chatted with people, took pictures, and listened to the stories that were being shared. It was just like being in someone’s living room for a party: everyone was friendly and there was no barrier between the performers and their audience. This was my first time seeing a performance at the Shalin Liu in Rockport, MA. It is a charming theatre, built with very modern architecture, but giving a nod to the old fishing town. Made with post and beam construction, the 3-story ceiling gives the room a majestic feel. There is a striking floor to ceiling wall of glass right behind the stage overlooking the water, which must be absolutely beautiful when the curtains are drawn for daytime performances. I’ve seen Hoey perform twice now, once when he joined James Montgomery and now with his own band. Included in Rolling Stone’s top 100 guitarists of all time, he is about to go on the Guitar Gods tour with Yngwie Malmsteen, Uli Jon Roth (Scorpions), & Ron “Bumblefoot” Thai (Guns ‘n Roses). Too bad they’re not making a stop in New England, but take a look to see if they’re stopping near you, it should be a great show! !